They are used in factories, warehouses, manufacturing facilities and construction zones. Industrial reels are designed to handle frequent spray downs, a wide range of temperatures, exposure to harsh chemicals and continuous use. Often times industrial reels support high pressure hoses that are designed to spray water, air or heavy liquids like oil or grease. Potable water systems, air and hydraulic tools, wash down equipment, refueling operations, lubrication and maintenance bays, arc and gas welding, cable storage, electric power tools and industrial lighting all use industrial reels to keep hoses and cords organized whether in use or in storage. Using reels in industrial settings improves worker efficiency, productivity and safety. They are used to store cords and hoses and keep them untangled. Their main purpose, however, is to protect hoses from unwanted damage and to ensure they are kept working at their peak performance. Industrial reels are strong, reliable and improve safety conditions in the workplace by eliminating loose cord or hose slack that could create a tripping hazard. Most industrial reels automatically retract instead of requiring manual rewinding. This feature is either electrically, spring or pneumatically powered and requires minimal manual effort. Those that need employees to rewind by hand are often equipped with a hand-turned crank. They are cylindrical in shape, similar to a large spool, and wind cords, hoses, rope and electric cables to be used indoors or outside. Industrial reels are often horizontally mounted to the ceiling or floor. Those that require maneuverability are designed with a handle or as part of a wheeled cart for workers to commonly move around the facility. 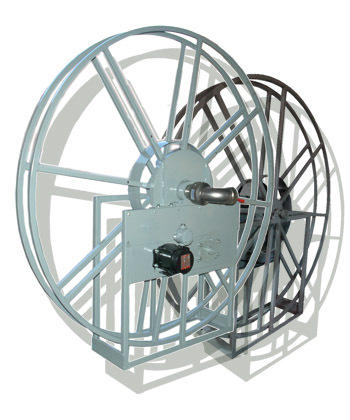 There are several safety features of industrial reels. An adjustable drag prevents the hose or cord from spinning off the reel when pulled on, and locking ratchets are safety mechanisms that help regulate hose pressure. Reels that carry electrical cords for outdoor use must be waterproof, and are equipped thermoplastic cord insulation that has an opening for a socket and a non-twist socket mounting to prevent unwinding or tangling. Many industrial reels are used to hold electrical cords. Those that are must be used with caution because a rolled up cord or cable has a much higher chance of overheating and creating a fire hazard. Industrial Reels Industrial reels are hose and cord reels designed to withstand the toughest conditions and wear. They are used when a longer hose or cord larger in diameter is needed for industrial applications.